From Green Bay, Hwy 32 to Mountain, Right on Hwy W to Crooked Lake. Right on Chapel Ln to Left on Schmidt Ln-property on corner. The details on 11896 SCHMIDT LANE: This house located in Riverview, WI 54114 is currently for sale for $34,900. 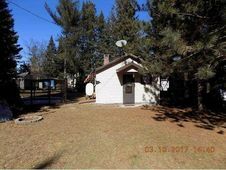 11896 SCHMIDT LANE is a 285 square foot house with 1 bed and 1 bath that has been on Estately for 769 days. This house is in the attendance area of Suring High School and Suring Elementary School.